Our cyborg future may not be far off.An ultra-stretchy battery could one day be used to power bionic eyeballs, brain-wave monitoring devices and robotic skins, new research suggests. The new device, which embeds tiny lithium-based batteries in a silicone sheet, can stretch up to three times its initial length and could be recharged wirelessly, Yonggang Huang, study co-author and a mechanical engineer at Northwestern University, wrote to LiveScience in an email. The new battery is described today (Feb. 26) in the journal Nature Communications. 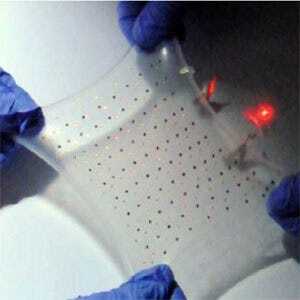 Other researchers have developed stretchy and paper-thin batteries before, but most didn’t deform much or have the ability to recharge wirelessly, Huang wrote. Toward that end, Huang and his colleagues embedded tiny lithium-ion batteries in a framework of conducting wires arranged in a repeating S-shaped pattern that, like a fractal, looks similar at several scales. The whole arrangement is printed onto a stretchable silicone sheet. The wires themselves are brittle, but uncoil like a spring, allowing the whole device to be flexible without forcing the delicate lithium-ion batteries to break. Tiny lithium ion batteries are connected through wires that uncoil like a spring. 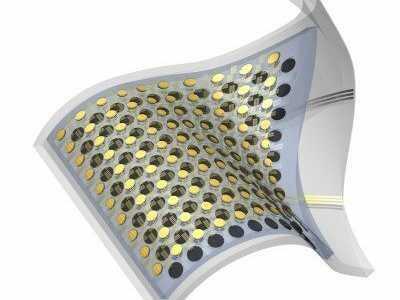 To demonstrate that the concept actually worked, the team powered a red light-emitting diode (LED) while stretching and twisting the battery.The researchers envision the battery being used for wearable gadgets, implantable brain-wave monitors, or other bionic devices. While the new design is incredibly innovative, it wouldn’t produce enough power to keep a laptop, or even a large light bulb, running, said Gao Liu, a chemist at Lawrence Berkeley National Laboratory who is developing stretchable batteries for transportation systems, but who was not involved in the study. That means it mainly would be useful for a few narrow applications, such as biological implants that don’t require very much power, Liu said.